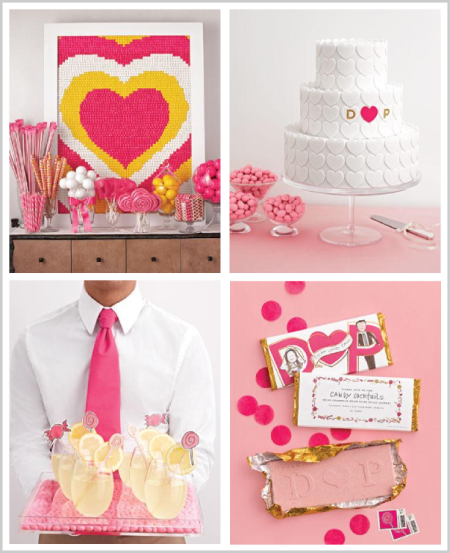 I saw this AMAZING Candy Themed Bridal Shower recently on Martha Stewart Weddings and it was too fantastic not to share… there are so many creative candy-themed ideas to be found here! Hosted by Darcy Miller of Martha Stewart Weddings, it’s really not surprising that this bridal shower came out so cool… from the fabulous “candy artwork” backdrop and gumball garlands to the super fun display of DIY rock candy rings – which are WAY too pretty to eat of course and such a fun activity idea for the party guests! The guests were served up comfort foods, including these miniature turkey burgers, and cones filled with savory flavors. 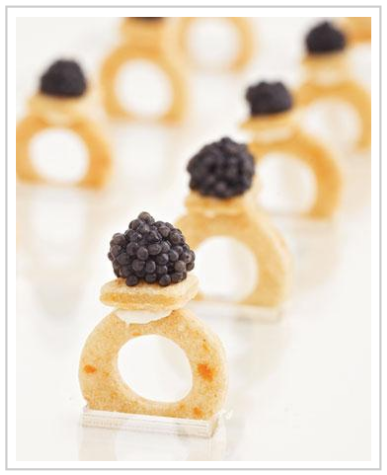 Witty (and delicious) caviar "gems" top cracker rings! Tubes of Jelly Belly jelly beans in gradient colors were set out for guests to take home along with little cellophane bags where guests scooped their goodies into. Friends were asked to write "sweet wishes" with personalised pencils on candy-shaped notecards. Cheeky Ring Pop favors were presented to guests as if they were crown jewels and candy necklaces, tucked into jewelry boxes, were another playful favor.